Recently we took some time away from our usual digs and spent a glorious week in the Franche Comte. 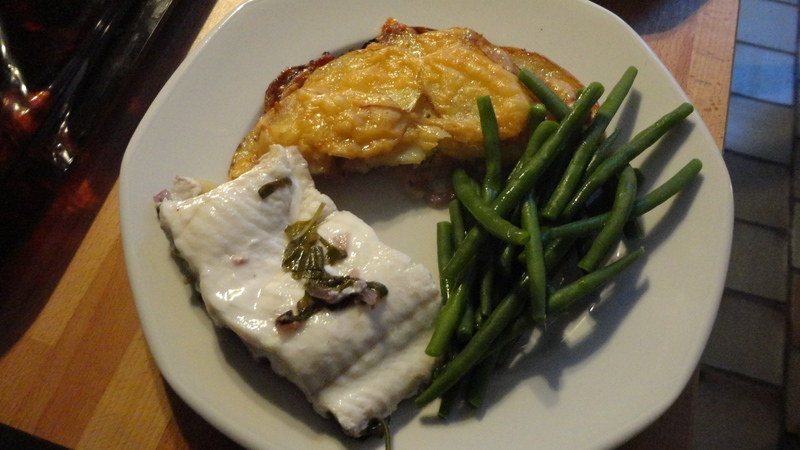 We’ll be featuring some of the local foods we enjoyed while we were there – including this fresh-caught fish with haricots verts and a sort of rosti with comte cheese. 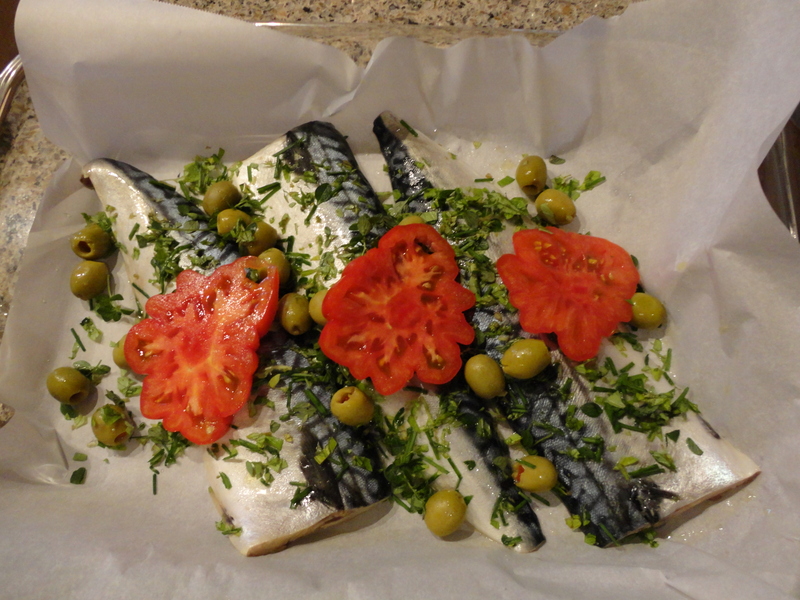 Mackerel. Slightly mineraly. Beautifully striped. A paradox to those who only know what to do with the pinky, meaty salmon, or the large-flaked cod. 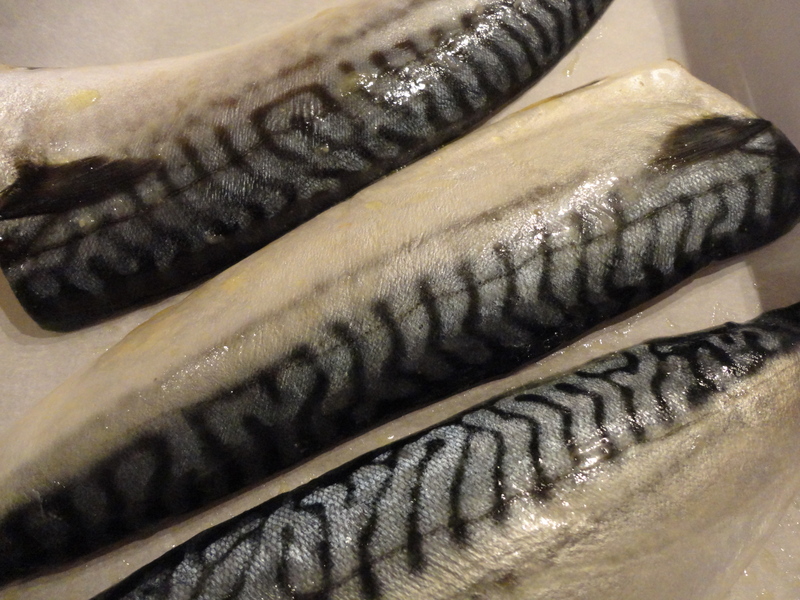 But mackerel is such a beautiful, special fish, it’s hard to resist. The husband bought these beautiful fillets at Hooked. It wasn’t the most pleasant day, so grilling was out of the question. It was cool enough for the oven, though, so a plot was hatched. Pair the oily,mineraly flavour with some Mediterranean influences – olive oil, tomatoes, olives, capers, and oregano. Everything went in the oven at about 400, for 20 or 30 minutes, just until done. We couldn’t have asked for a better end to the day. MMM…Who's Got your Goat (Cheese)? Sometimes you need to do a fridge-clearing. And you need lunch. What to do? The other day we had some tremendous soft goat cheese from Leslieville Market, that needed to be used or wasted. Combine that with some tasty spelt bread (made fom spelt from Monckton’s), and you have a perfect start. A long time ago we learned that fig and goat cheese were a wondrous combination. 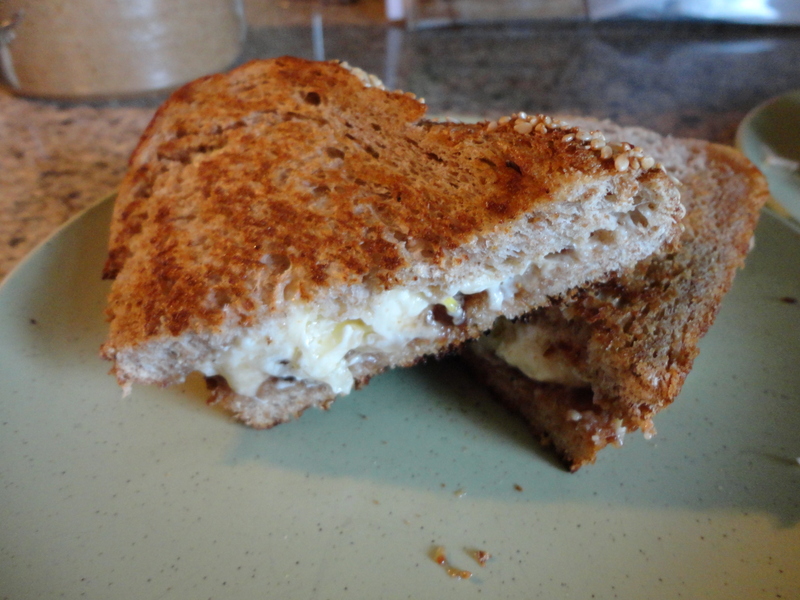 So we spread a little fig jam on the bread. Then the cheese. A sharp, coarse grind of pepper came next. We spread one side with butter, and put more butter in the pan. Next, we cooked them up like a regular grilled cheese. Creamy. Aromatic. Buttery goodness. Author WalkEatLivePosted on July 15, 2011 Categories UncategorizedLeave a comment on MMM…Who's Got your Goat (Cheese)? The Belanger Brothers favoured us with some lamb leg steaks recently. They were a little big to just fire on the grill (if we wanted to keep in fighting trim). 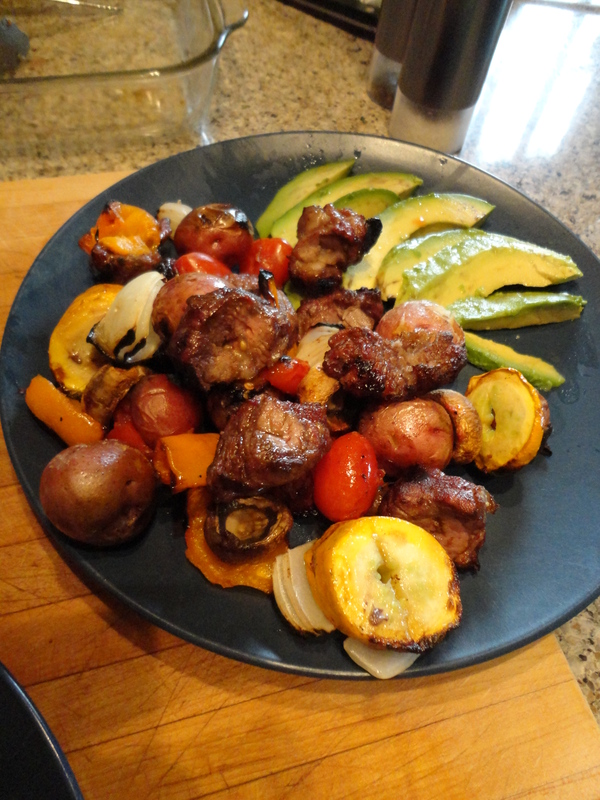 So we diced them into nice cubes and threaded them onto skewers. 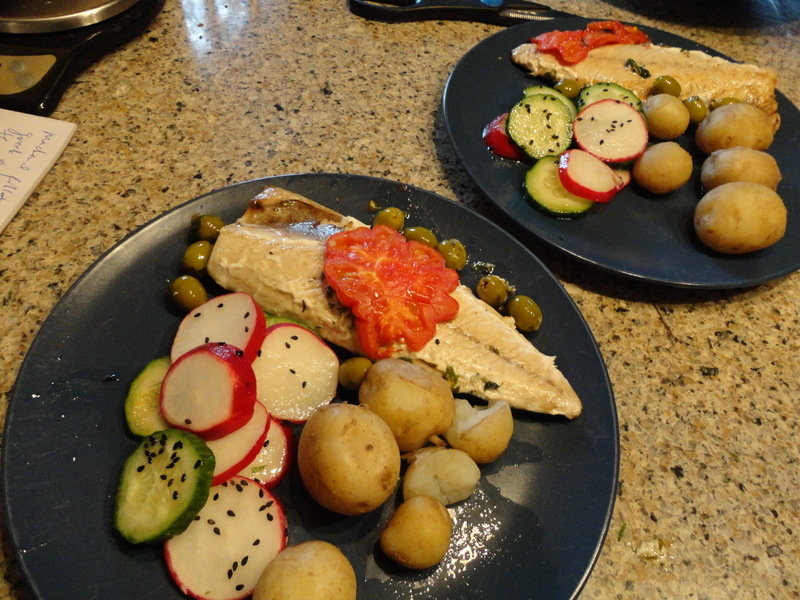 In between, we had mushrooms, baby tomatoes, yellow zucchini, and onion. When they were grilled, we served them on platters, with some creamy avocado, sprinkled with lemon. It’s not local – but it’s our kind of local. We bought it down the street at Kelly’s. Author WalkEatLivePosted on July 13, 2011 Categories Grilling, Healthy Eating, UncategorizedTags Home cooking, lamb, local food, locavore, neighbourhoodLeave a comment on Skewered! We had some leftover salmon from Hooked, because it’s hard to resist taking the whole fillet when it’s there, glistening in the case. Coming home for lunch, we looked to see what we could do with it. 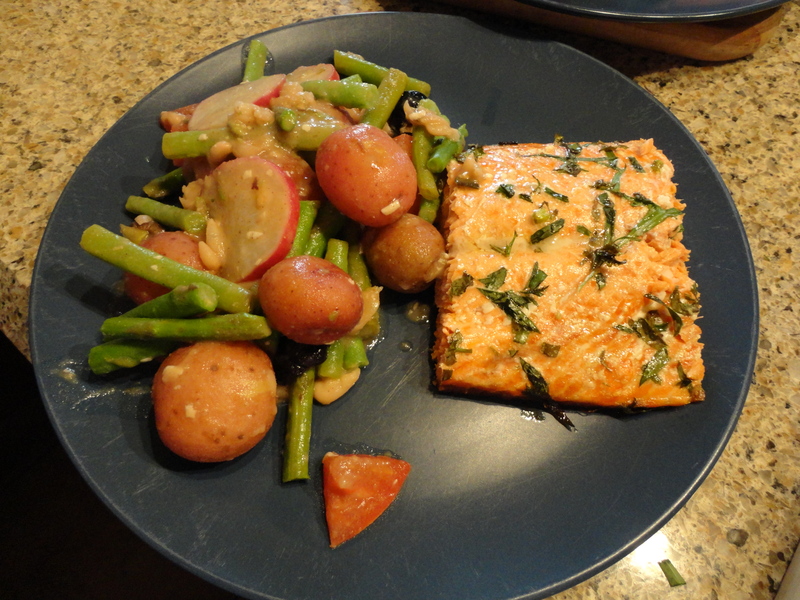 The farmer’s market was featuring radishes, beans, and asparagus. 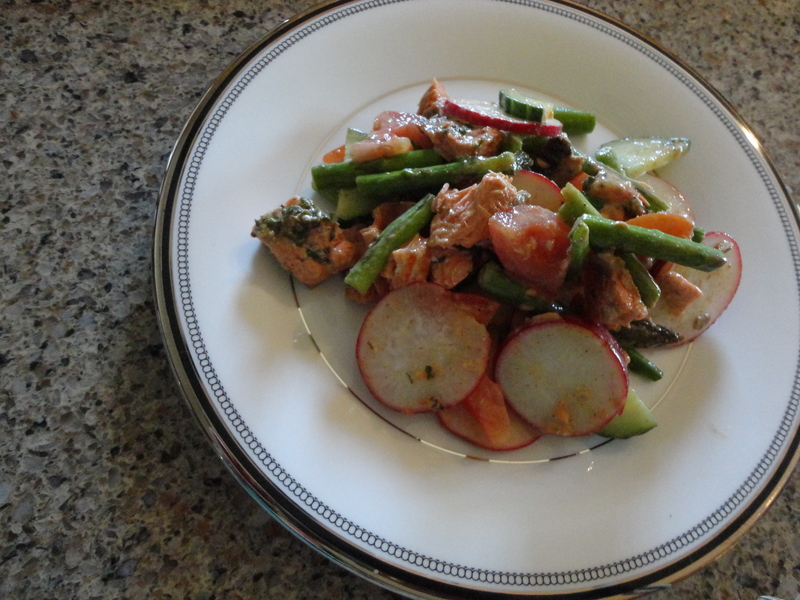 We sliced the radish, and lightly tossed the green vegetables in some butter and lemon. We used the cooking liquor to mix with a little mustard, and tossed the whole thing together. Sitting on the deck, shaded by the trees, it was cool and soothing. Himself went to Royal Beef one day recently, when the skies were blue and cloudless, and the barbecue was calling his name. 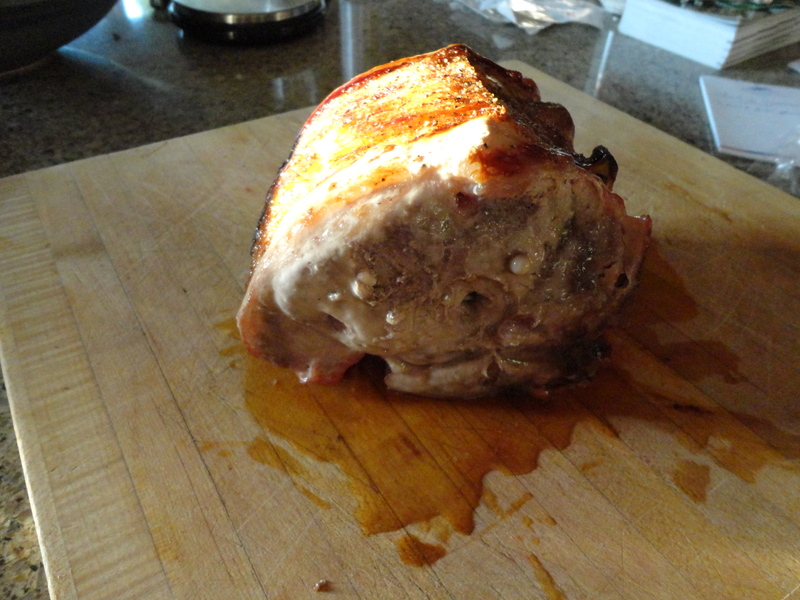 What he found was this tremendous-looking pork roast. He dressed it with a little salt and pepper, some dry mustard, and put it on the spit. Slow, steady cooking was what it needed, and then a rest. Although there were juices on the board, with a little tenting, most were retained, and it was moist and marvelous. For some time now, Number One Son has opted for birthday pie, instead of birthday cake. This year was no exception. 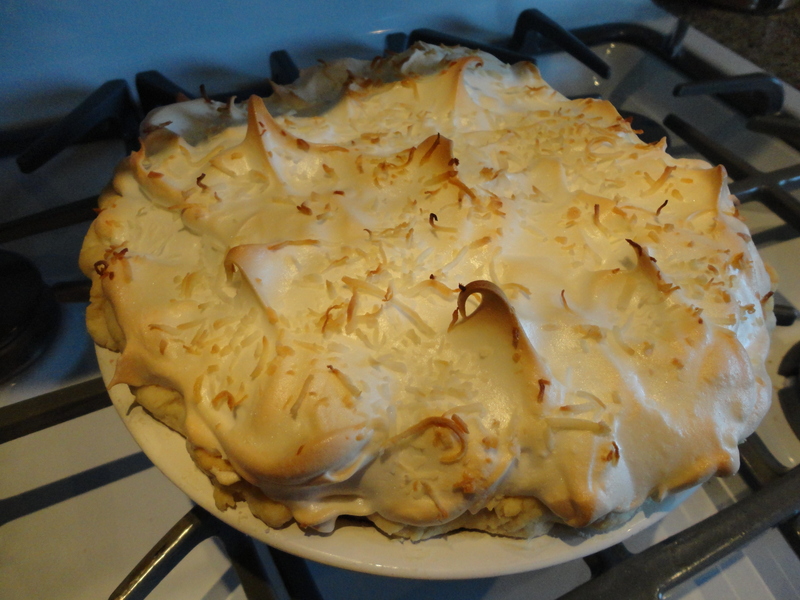 But we try to mix it up and make a different sort of pie each year. This year, that childhood classic, coconut cream, was the one. We had some wonderfully fresh eggs from Rowe Farms, and coconut from Better Bulk. Of course it all starts with the pastry, light and flaky – any basic recipe will do, because it’s all about the practice. The feel of when it’s right evolves with practice. 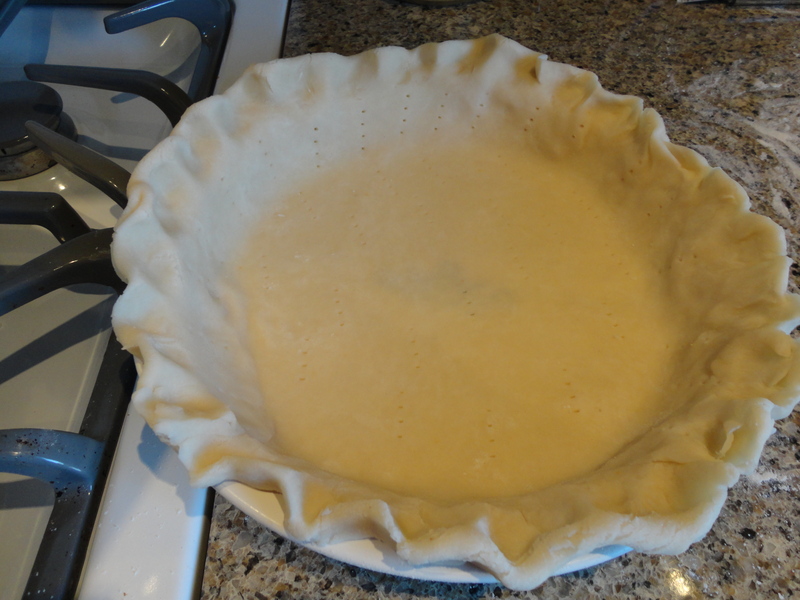 Author WalkEatLivePosted on July 9, 2011 Categories UncategorizedLeave a comment on Birthday Pie! 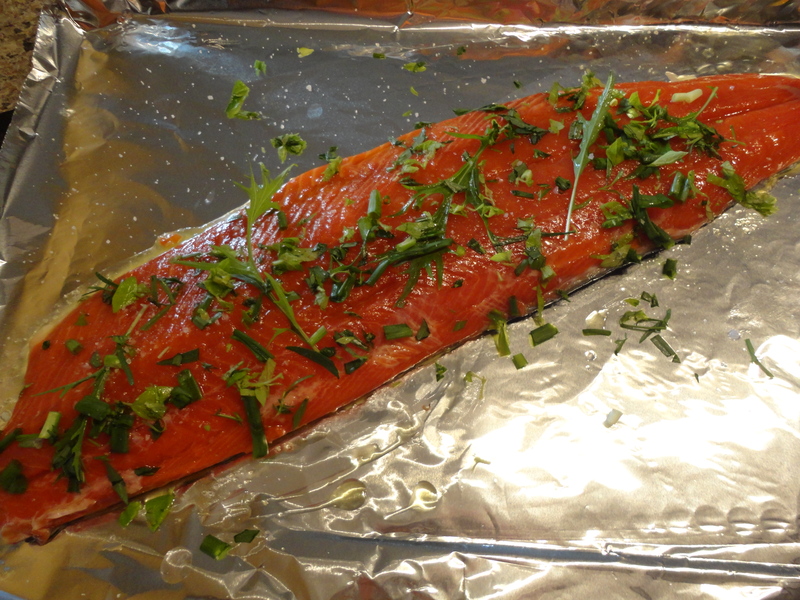 Recently we had some Copper River Salmon from Hooked. It looked sublime, even before it was cooked. We took the fillet and rubbed it down with a little olive oil, then chopped some herbs over it – green onion, tarragon, oregano, and garlic chives. We sprinkled some dry mustard over, and gave it a very light grind of salt. We cooked it on the grill, on a sheet of foil, since we didn’t have a plank. The smell was glorious. While it was cooking, we boiled up some baby red potatoes, and sliced up a radish or two. We mixed those in with the bean salad from the day before. It was an amazing feast. There's a Reason to Freeze your Beans! Remember back in the spring, when we were baking and freezing batches and batches of beans? This was one of them – white beans with rosemary. Fast-forward to a blisteringly hot day, and those frozen beans came in handy. We put them on the counter to thaw in the morning, and stuck them back in the fridge when they were slightly icy, around lunchtime. About half an hour before dinner, we mixed up a couple of tablespoons of white wine vinegar, a tablespoon of creamy Dijon, and some olive oil. We blanched some green beans, peas, and asparagus, then chilled them quickly in an ice-water bath. We chopped in a litte oregano from the garden, and a green onion. Then we diced a couple of farmer’s market tomatoes. We grated in some cheddar from Montforte. Then we tossed it all together in a big bowl with some salt-cured olives from Plank Road Market. Pair it with a light, bright, summer wine, and the heat will suddenly seem more bearable. 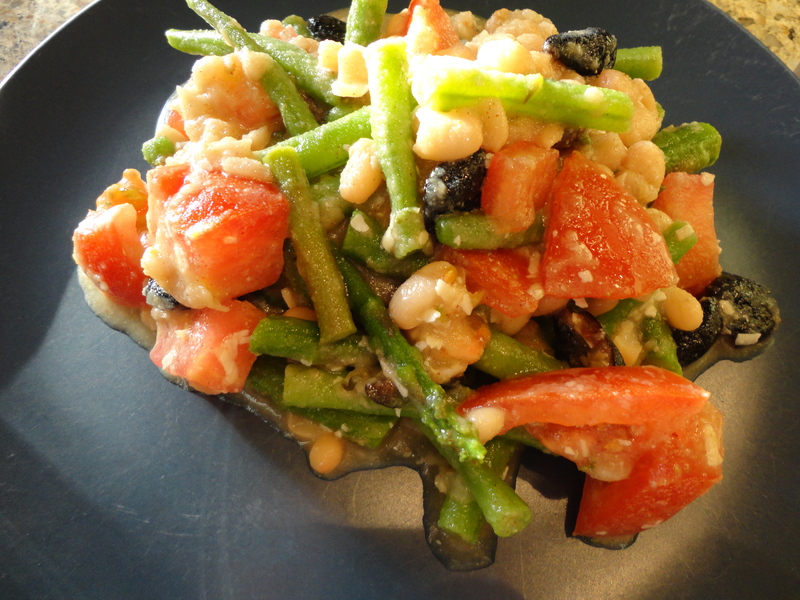 Author WalkEatLivePosted on July 5, 2011 Categories Hot Day Food, Recipes, Relaxation, Salad, VegetarianTags beans, Dijon, food, health, Home cooking, local food, salad, tomatoesLeave a comment on There's a Reason to Freeze your Beans! Another Grain in your Bread? How's that Spelt? A week or so ago we picked up some amazing spelt flour from Monckton Organic Farms. It makes tremendous bread, and also pasta. We even made some pizza this week, using their amazing flour in the crust. Every bit turned out to be delicious. 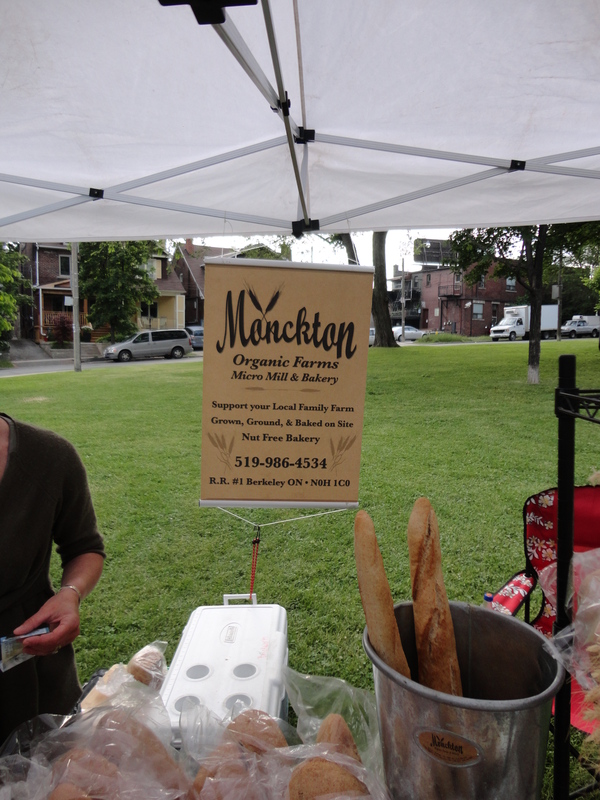 If you don’t have the time or inclination to make the bread yourself, you can find the good folks from Monckton at the East Lynn Farmer’s Market. Stop by and say hi, and buy some flour or bread. You won’t regret it. Author WalkEatLivePosted on July 3, 2011 Categories Baking, Healthy Eating, Slow FoodTags bread, flour, Home cooking, local food, neighbourhood, speltLeave a comment on Another Grain in your Bread? How's that Spelt?